I consider myself pretty good at practicing self-care. I meditate daily, exercise regularly, go to bed early. But recently, the strain of working and attending graduate school raised my anxiety levels. Then I dealt with a health issue. Then I dealt with a family situation. Then, I got injured and could no longer work out. As my stress levels shot up, I focused on what seemed most important: getting my work and school work done. I slept less, worked more. 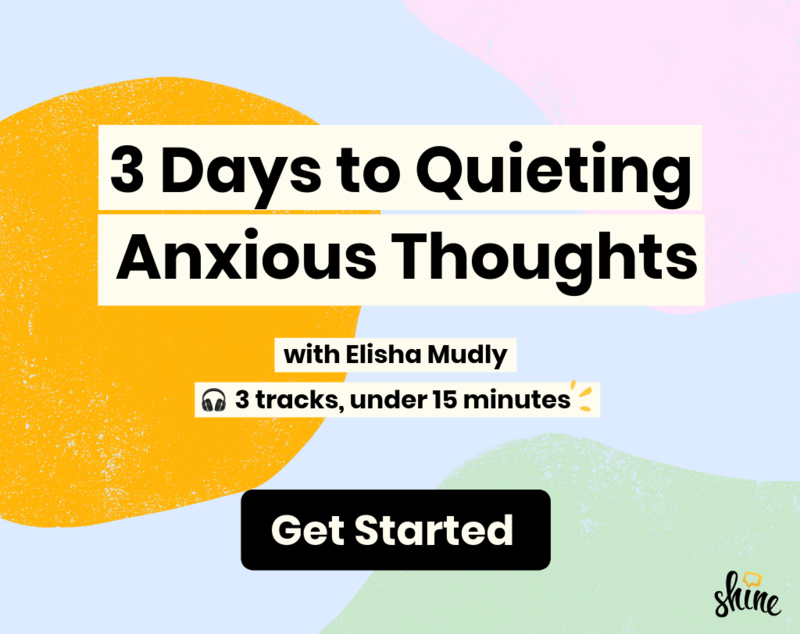 It wasn’t until I woke up one day feeling exhausted, overwhelmed, and very, very low that I realized I’d let go of the most important part of my routine: the part that focuses on me. I realized I’d let go of the most important part of my routine: the part that focuses on me. I’d stopped stretching and meditating in the morning, wasn’t hitting the gym, my diffuser was untouched, and I worked until it was time to go to sleep. When I decided to recommit to daily self-care, I wondered where I’d find the extra time. I needed a nudge, a reminder that time spent on myself is not time wasted. So I turned to 7 Days to Self-Care challenge in the Shine iOS app, narrated by Britt Julious. I figured I could use some motivation on my commute. And this way I wouldn’t waste precious productivity time. It was 9:45 p.m. After a day of work and class, I found myself in a backseat of a cab, not in the mood to listen to music. So I dove into my Shine challenge. I knew I’d made the right choice when the first session started with an Audre Lorde quote: “Caring for myself is not self-indulgence. It is self-preservation.” Day 1 focused on how self-care is more than topical applications, it’s about “nurturing yourself from the inside, and how you balance your life and mental health on a daily basis.” This reminded me that burying myself in work was not a sustainable way to deal with everything else going on in my life. At just a little over 6 minutes, the track was the perfect kickoff. What I learned from it: I can always count on my breath to calm me down, and taking care of myself is what’s most important. The session was a great reminder that we don’t always extend the same kindness to ourselves as we do to others. Just listing the things that were keeping me occupied helped me recognize I needed to slow down. This track focused on celebrating the things I had accomplished, no matter how small. I listed some things: I’d finished all my homework, exceeded goals on a work project, bought groceries, washed my hair (not an easy feat with a head full of curls). Recognizing that these actions take time, effort, and dedication helped me celebrate actions I’d previously just ignore. These are not things I usually feel proud of, as a lot of these are just things that need to get done. But recognizing that these actions take time, effort, and dedication helped me celebrate actions I’d previously just ignore. It also reminded me that while I couldn’t stick to my regular workout regimen, staying physically active wasn’t completely out of the question. Later that day, I attended a Bikram yoga class, participated as much as I could, and glowed after. By Day 4, I started looking to prioritizing myself via the challenge. Britt asked if the people and things I spend my time with serve me. “Do they light you up?” she said. The people in my life do. But the things I spend most of my time on? Not always. This session prompted me to reset boundaries in my professional life. Work has a tendency to swallow me up and encroach on my free time. Just think about what you need. “Just think about what you need,” Britt said. I left work and turned off my Slack notifications. 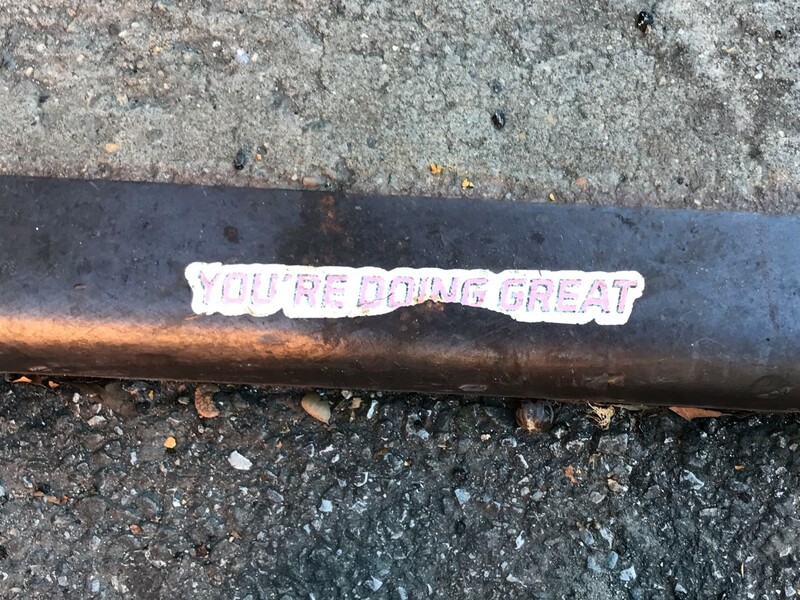 Later that day, a sticker on the streets of Harlem reinforced the idea that, yes, I was doing great. Aaaah, guilt. I feel it when I eat too many chips (Who else can’t resist plantain chips? I can’t be the only one), when I linger in bed (it makes me feel so good), when I watch one (just one) episode of Scrubs when I planned on doing homework. Are these activities important for self-preservation? Or are they taking away from my productivity? I wasn’t sure of the answer. “Sometimes the most productive thing we can do is focus on ourselves.”-Britt Julious. “Sometimes the most productive thing we can do is focus on ourselves” Britt said. True. Every minute I sleep longer gives me more energy. Every moment spent watching TV takes my mind away from the office. Every plantain chip I eat nourishes my soul. I ate three packs that day, dipped the chips in sour cream. It was delicious. It was for me. I did not feel guilty. The full list included the chips stashed in my cupboards, having enough money to go on vacation, and other things I usually don’t take time to reflect on. This exercise reminded me of Dopamine, one of my favorite songs by Bas. He raps/croons/says “You're only as low as you think… You’re never as low as you think, nah, nah, man you’re never as low as you think.” Yes, I was still stressed, but I was also taking stock of all the good in my life. And remembering to do the small things that make me feel good. Every day. Bonus: This exercise caused me to dig up my gratitude journal. (Why did I stop writing in this again?) As things got busy, this activity was the first to go. But now it’s back, and I swear by it. 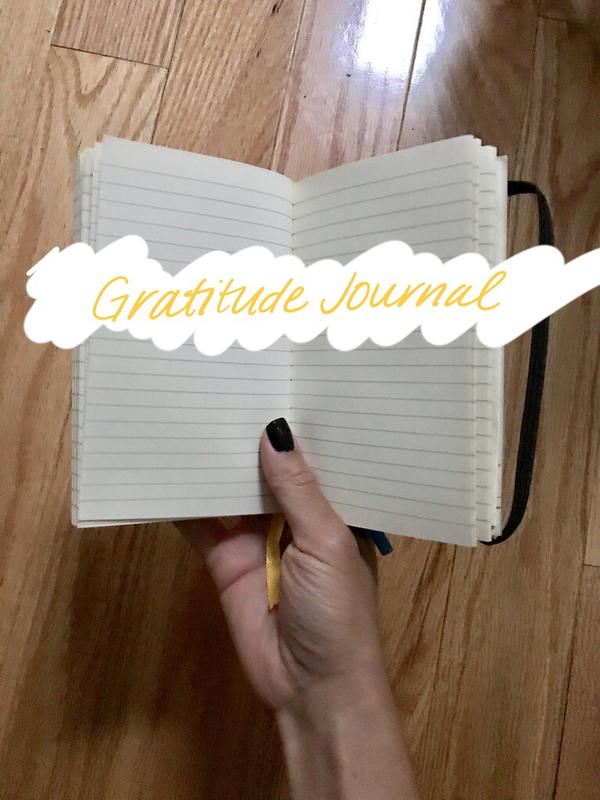 If you haven’t tried keeping a gratitude journal yet, it’s easy. Grab a notebook, a post-it, a piece of paper, anything you can write on, and write down one thing you feel grateful for. For me, one sentence blurs into three. It makes me feel wonderful. When I reached the final day of the challenge, I felt kind of sad it was over. In one week, in just five minutes a day, I was reminded of the positive impact of prioritizing myself. And the importance of doing this every. single. day. Especially when things get rough. In one week, in just five minutes a day, I was reminded of the positive impact of prioritizing myself. I’m back to morning meditations, stretching, working out when I can, and being grateful. I’m also on to my next challenge. A preventative one to make sure I don’t let my energy fizzle to the point where it can’t be rekindled. Hello 7 Days to Beat Burnout—I look forward to growing even more over these next seven days. Danielle James is a writer from Brooklyn, NY. Her writing has appeared in the anthology We Rise to Resist: Voices from a New Era in Women’s Political Action and in other collections. She’s a 2017 Voices of the Year honoree and received the Diversity in Tech Award for her work to create opportunities for members of underrepresented groups in technology. You can stay up to date with her latest projects at dksjames.com.